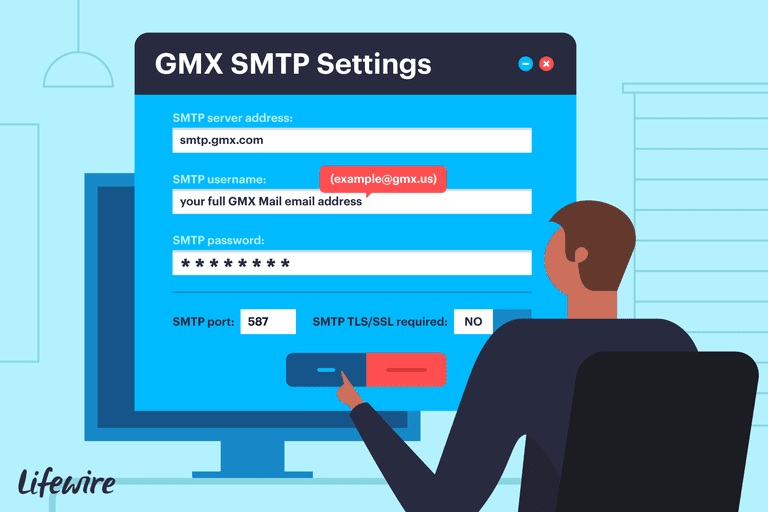 To send mail through your free GMX Mail account, you have to set it up first with the proper outgoing SMTP (simple mail transfer protocol) server settings. These settings are typically filled in automatically through the email client, but if they are not, you need to enter them. You can access your GMX Mail email account from any browser, but you might prefer to access it in a different email program for convenience. When this is the case, your email client needs to know how to access mail from your GMX Mail account, which is done through IMAP and POP3 server settings. All email providers use SMTP server settings, but they aren't the same. Before sending an email from your GMX account, you must enter the following information. It is probably already there, but you should confirm this anyway. If you have any problems with outgoing mail, start your troubleshooting here.